Our mission is to provide support and encouragement to people across the globe while we bring Honor and Glory to God through His son Jesus Christ. The goal is to win as many souls as possible by lifting up the name of Jesus. This prayer wall has been powerful and effective. We started it with the fruit of the Spirit and later felt led to add a name to the wall. The first name was of a lady that had to have a quadruple bypass surgery. First, doctors said she was not healthy enough for the surgery. After two days on the prayer wall, the doctors performed the surgery. Her family was told she would be in ICU for two weeks. Three days later, she was in a regular hospital room. Then, doctors said she would be in the hospital for at least a month. Two weeks later, she was fully recovered and back at home. God has blessed this Prayer Wall and I know He will do the same for you. 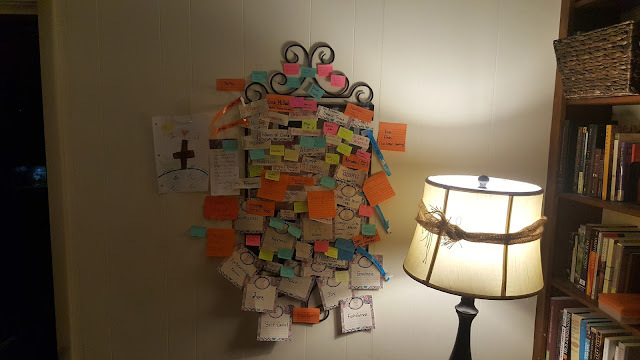 I encourage you to start your own Prayer Wall today! 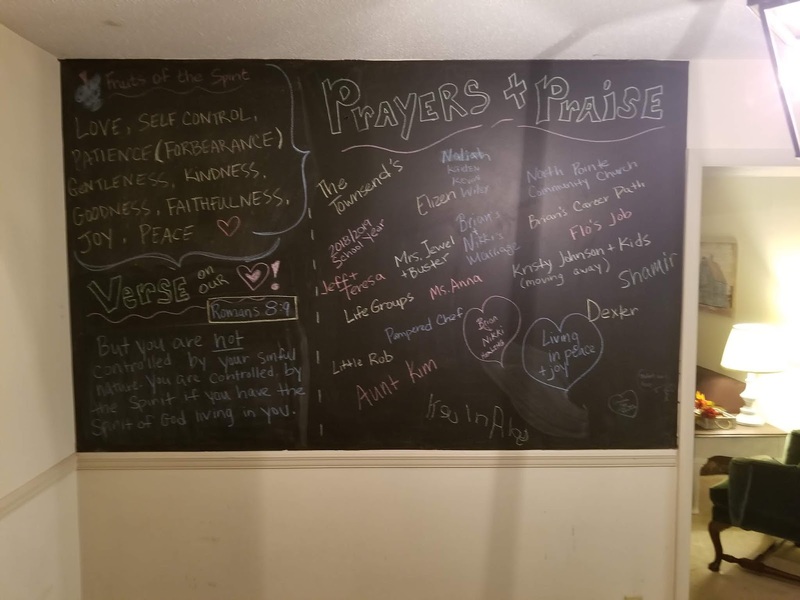 Our Prayer Wall has grown into an entire chalkboard, wall! Praise God! Inthe era of Postmodernity, no one facet of the humanized culture has been more accepted, more revered, and yet has caused more damage than the quest for human control. The human mind desires to be in control of everything, from creation and sustenance, to degradation and death. The quest for control has driven many a man to his wits end and several to an early grave. “Perhaps nowhere is this sense of human control more evident than in reproductive technologies” (Hollinger p. 96). The influence and implications for Christian ethics that man’s need for control is having is the reduction of God as the world’s Sovereign. If one desires to have children and cannot, they hurry off to a fertility clinic. Likewise, if one is pregnant and desires not to be, they hurry off to an abortion clinic. No one trusts God’s will and His plan for their lives. John 19:32-35: "The soldiers therefore came and broke the legs of the first man who had been crucified with Jesus, and then those of the other. But when they came to Jesus and found that he was already dead, they did not break his legs. Instead, one of the soldiers pierced Jesus' side with a spear, bringing a sudden flow of blood and water. The man who saw it has given testimony, and his testimony is true. He knows that he tells the truth, and he testifies so that you also may believe" (NIV). Jonah 4:2: He prayed to the LORD, 'Isn't this what I said, LORD, when I was still at home? That is what I tried to forestall by fleeing to Tarshish. I knew that you are a gracious and compassionate God, slow to anger and abounding in love, a God who relents from sending calamity'" (NIV).